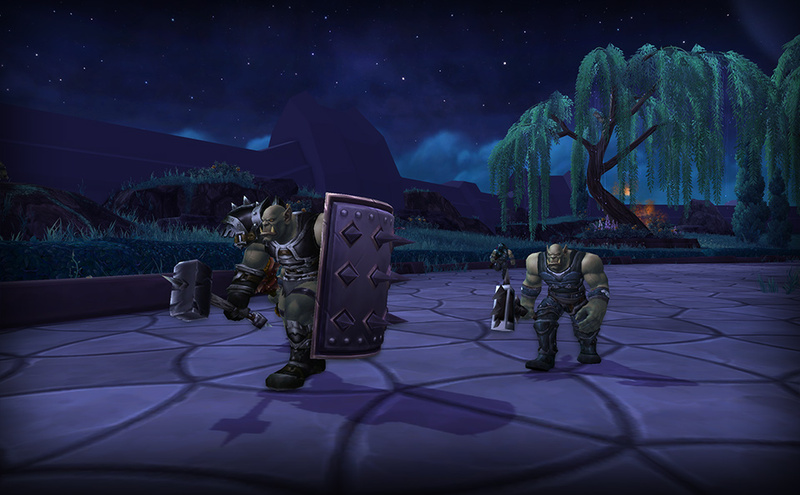 Warlords of Draenor sets you on a path into a brave and savage new world where you can play tragaperras. It’s a chance to take hold of your heroes’ destiny and shape the Draenor of the past – and it all starts in a very dangerous place. 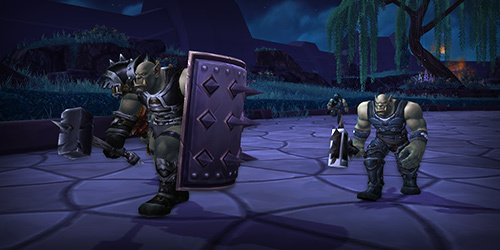 Long before the planet was ripped apart and became Outland, Draenor was home to brutish clans of orcs who went to war across a treacherous landscape. In primordial Tanaan, even the plants have teeth. Darkling fronds stab out at unlucky wanderers, or conceal canyons that plunge miles deep beneath the canopy – and these are far from the jungle’s worst dangers. Each day, warlords fell even wider stretches of Tanaan’s wilderness, striving to finally rend the gates of space and time for conquest unending. Your first steps into Draenor will be within the wilds of Tanaan Jungle, where the Iron Horde has staged their assault on Azeroth. With these new attacks, you’ll be charged with leading the greatest heroes of this age in the counterstrike. This is an invasion that can’t be ignored and the Horde and the Alliance are both set on taking the offensive before it’s too late. Your journey’s beginning in Tanaan Jungle is sure to present challenges – many of which have very sharp teeth – but it’s also where you’ll be introduced to some of the greatest orc warlords and heroes of all time. Unfortunately, the orc leaders of storied clans such as Grommash Hellscream of Warsong clan, Kilrogg Deadeye of Bleeding Hollow clan, and Kargath Bladefist of the Shattered Hand clan aren’t going to be happy to see you. They won’t welcome you with anything other than unbridled savagery. You really shouldn’t expect anything to be on your side in this jungle. Shutting down the Dark Portal is your first priority, but the mission may quickly go awry. Even if you do manage to seal the portal, your party will still be trapped in the middle of a hostile army. Your only option is to fight your way out! You might even be forced to accept the help of the infamous Gul’dan. Fortunately, you’ll also have luminaries such as Thrall, Khadgar, and Vindicator Maraad by your side. You’ll also meet some new heroes who will take up arms for you: the brutal Frostwolf warrior Ga’nar, and a promising young draenei acolyte named Yrel. For those newly boosted to level 90 in Warlords of Draenor your experience in Tanaan Jungle will gradually introduce you to your new class abilities and mechanics. You’ll still be able to join your friends in this new adventure while becoming acquainted with your new hero and taking on greater challenges and gaining greater rewards. 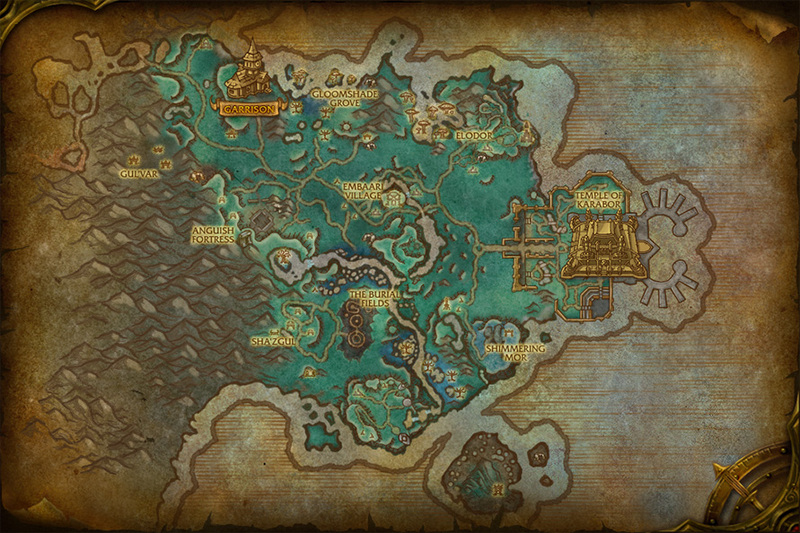 Your initial time in Tanaan Jungle will have an impact on your journey further into Draenor, and your first foray into its depths will be the jumpstart to your many adventures to come. While your time surviving the travails of this first adventure will be fast and a bit furious, never fear, this won’t be the last you’ll see of this terribly savage place. Blood and thunder await you! There’s always been a lot of vanity items in WoW; many of them just used to be a little harder to acquire and… a little cooler. They used to be a little more to brag about. In this article, we’ll look into the best of the old vanity items – but only the ones that change your appearance. For now. Blizzard put up a preview of Shadowmoon Valley today! Hidden under a shroud of perpetual night broken only by bright starlight, the lush idyllic forests of Shadowmoon Valley are home to a majestic draenei tomb and sanctuary: Karabor. While many of Shadowmoon’s denizens study prophecy among Karabor’s ancient stone circles, plotters with darker ambitions lurk in the valley’s vast underground cave network, gazing greedily at the sacred temple. In Warlords of Draenor, Shadowmoon Valley serves as the starting zone for Alliance players once they’ve endured the initial rigors of Tanaan Jungle and survived their first encounter with the Iron Horde. 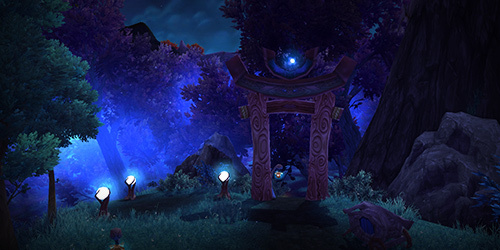 To take you on a journey through Shadowmoon’s forests, temples, and secrets, we’ve tapped one of the creative minds behind the zone, Senior Designer Helen Cheng. What’s the story in Shadowmoon Valley? Helen Cheng:After a daring escape from the Iron Horde in Tanaan Jungle, Alliance players crash land on the northern shores of Shadowmoon Valley. The valley is tranquil and serene. Rolling green hills give way to lush, violet forests. Draenei temples stand proudly beneath a star-studded sky. 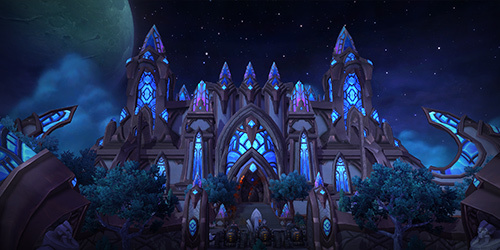 Here, the draenei have built wonders of their civilization—the town of Elodor with its majestic Altar of Sha’tar serves as the proud home of the great Exarchs, while the shining Temple of Karabor acts as the font of all holy learning. Under Prophet Velen and Exarch Akama’s watch, all is well. But times are changing. The Iron Horde have called the native orc clans to join their ranks. The Shadowmoon Clan, led by Warlord Ner’zhul, yearns to prove itself worthy to Grommash Hellscream. Beneath the valley’s bright moon, a dark star hangs in the sky. For centuries, the Shadowmoon have been forbidden to tap its void-touched energy . . . until now. Will Warlord Ner’zhul succeed in harnessing the star’s power to destroy the draenei and the Temple of Karabor? Or will Prophet Velen, aided by his disciple Yrel—and a few fearless heroes—be able to stop him? Meanwhile, trouble brews amongst the Exarchs, the most powerful and influential draenei heroes. Even as they debate the future of the draenei on their adopted homeworld, there is growing evidence of a traitor among their ranks. Who can be trusted? …there is growing evidence of a traitor among their ranks. Who can be trusted? The night elf Wardens sense a demonic presence in the northern woods of Shadowmoon Valley. As they hunt for the source of the fel energy, a sinister truth is revealed: Gul’dan, the Destroyer of Dreams, has returned. Most importantly, as a proven champion of the Alliance, you are charged with establishing the Alliance foothold on Draenor. The land is harsh and unforgiving, and the Iron Horde has amassed an enormous army without equal. Before you can hope to defeat them, you must build a stronghold—your Garrison—from the ground up and gather allies to face this indomitable foe. What are some of your favorite places within the zone? 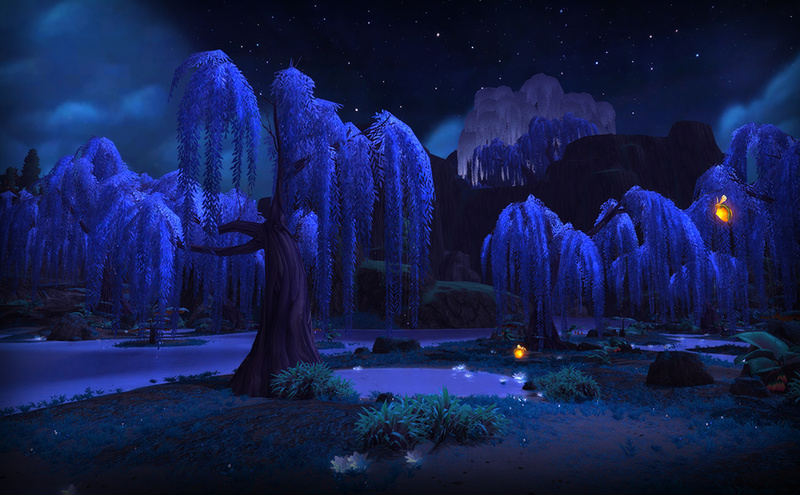 Helen Cheng: Shadowmoon Valley is one of the most beautiful places on Draenor, with a breathtaking variety of stunning areas. I would say that the two most striking aspects of Shadowmoon Valley are the draenei and Shadowmoon orc areas. 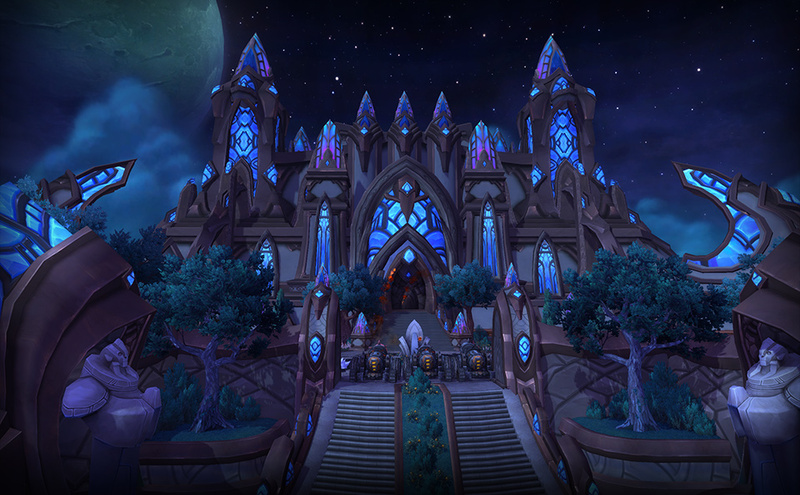 The draenei architecture in Shadowmoon is really impressive. You get everything from a merchant town in Embaari Village to the valorous training grounds of the Exarchs in the north to the crystalline dome that is Teluuna Observatory. The draenei are cultured and sophisticated. Theirs is the pinnacle of an advanced society, and their towns and cities reflect a perfect balance of beauty and function. I really love all of the draenei locations—and there are more in other zones—but the Temple of Karabor has to be one of my favorites. The sheer size and scale of the place is incredible, and it’s remarkable to see it in its glory before the events of The Burning Crusade, which turned it into the Black Temple under Illidan’s control. The Shadowmoon clan structures are impressive as well. The Shadowmoon were once a wise people, with a deep respect for the elements and a natural curiosity about the stars. They are natural-born leaders with a strong affinity for magic. However, since they joined the Iron Horde, Ner’zhul has strayed from the ancient ways. You can see this gradual decay reflected in their way of life. 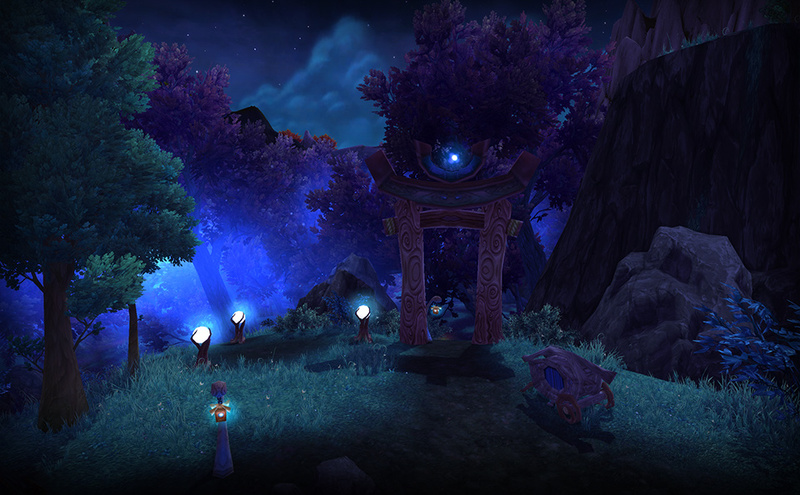 The Burial Fields is a place where the Shadowmoon traditionally bury and honor their dead. That place has become defiled and corrupted with void magic. Their ancestors, whom they once revered, are now being brutally tormented. Ner’zhul’s stronghold, Anguish Fortress, is an open-air ziggurat with a sacrificial pit in its center. In a nearby dungeon, players will see that there are more dark secrets hidden beneath this compound. Tell us more about the Alliance garrison! Helen Cheng: Nestled near the northern shores and with a commanding view of the main road, the Alliance Garrison location is of immense strategic importance. Prophet Velen will give the land to players as a thank-you for their deeds in the jungles of Tanaan, the intro zone. But there isn’t much time to rest—as great as the Prophet is, he needs your help. 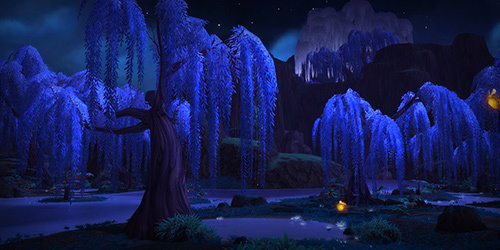 Your Garrison is awfully close to Shadowmoon territory, so be prepared to defend it. …the Alliance Garrison location is of immense strategic importance. Your Garrison will start as little more than an outpost, and your laborers will quickly run into trouble as they discover that even the forests of Draenor can be their enemy. But before long, you should have a comfortable Town Hall to call home and a Barracks that you can use to train new recruits. One of the perks of having your home base here is the ability to sound a “call to arms” anywhere in Shadowmoon, and Alliance troops will rush to your aid. Kick your feet up – after all, the Garrison is all yours. Could you name three of your favorite locations players should check out on their journey through the zone? Helen Cheng: Once you’ve settled in, you should take a quick jaunt over to the town of Elodor, home of the revered Altar of Sha’tar with its stunning view of Karabor and the surrounding ocean. There you can meet the five Exarchs who act as the hand of the Prophet, guiding draenei society, and you can witness their own internal conflicts as they argue about their place in this savage land. Don’t miss the nearby Rangari Enclave, where the elite scouts of the draenei train—you won’t see mushrooms that size for another 30 years! If you’re the adventurous type, try spelunking in Bloodthorn Cave. Don’t mind the flesh-eating pale orcs—they only kill you when provoked. Also, don’t eat the local mushrooms. They can be rather . . . potent. We’ve heard mixed reviews about Gloomshade Grove. Some folks rave about the pristine beaches, while others are just never heard from again. If you see anything that looks like a flower, makes a sound like “mawarwaawa,” and has very sharp teeth, run away! Though it’s probably too late for you, so oh well. Don’t say we didn’t warn you! You’re probably wondering if there are any creatures on Draenor that won’t bite your head off. Try heading over to the Shimmering Mor. This enchanted forest glade is home to wild faerie dragons. Awww, they’re just so cute! No, you can’t take one home . . . oh, who are we kidding? You’ll probably find an egg or some-such to raise eventually. Finally, don’t forget to stop by Embaari Village. This draenei merchant town is known for its delicious food and exotic wares. No trip to Shadowmoon is complete without a tasty meal and a mug of honey mead. As with all places on Draenor, Shadowmoon Valley is filled with sights to see, adventures to be had, and savage enemies to destroy. Enjoy your journey! Next, our voyage will take us north into the Horde starting zone of Frostfire Ridge. Stay tuned for more! Today we take a look at one of the rare events in Frostfire Ridge that is not your standard kill the rare fight! As you may have noticed, the most recent update to the patch notes included the removal of the Active Mana Regeneration, and I’d like to take a moment to explain that a bit.First, I’d like to dispel some misconceptions about what Active Mana Regeneration was. Due to the similar name, and how it had its own section in the patch notes, some people were under the impression that it was as significant a feature as Active Mitigation was for tanks; that was not the case. It was quite minor in its impact. We found, based on internal testing, that in order to make it impactful, we’d have to make it much, *much* stronger. As it was, most forms of it were only worth using when you had mismanaged your Mana and were trying to recover. Based on its low and unintuitive usage, we decided to remove it. Now, a fair question to ask is, “Why not just tune it stronger, so it *is* worth using?” We considered that heavily. There is probably a design where most of your Mana regeneration comes from active sources, and all healers spend a significant portion of their time and ability usage actively regenerating their Mana. However, that is a gigantic change to healer gameplay, for all healers. Many existing healers would not enjoy that style of gameplay, and we’re not even sure that it’d be better gameplay for a new player anyway. Overall, we think that, while that option does seem like it could potentially function, it would not be good for the game. So where does that leave healers for Mana management? Rest assured, healers will still have significant control over their Mana. The primary method for doing that is through spell selection. We’ve tuned healers such that they have a mixture of high efficiency and high throughput heals. If you maximize efficiency, you’ll actually be spending less than you regenerate (as of about blue dungeon gear), so your Mana bar will actually be going up. The way you’ll spend that Mana is through high throughput heals, which will let you burn more mana for more throughput. As your gear improves, you’ll get more and more Spirit, so that your Mana refills faster while casting efficient heals. And that additional Mana will translate into more and more of your spell casts being high throughput ones, as you get better gear. The key, as it relates to Active Mana Regeneration, is that if you find yourself at 30% Mana, and the boss is still at 50% health, you do have something to do to catch up: lean more on your efficient heals, until you catch up. You’ll never end up in a situation where you run OOM and are unable to cast anything. Also important to note, all healers have some way to deal minor damage with no Mana cost now, so that they have something to do when there is no healing needed, if you’re the type of player that feels compelled to always be casting something.